Details: Use as cricket carrier/habitat. 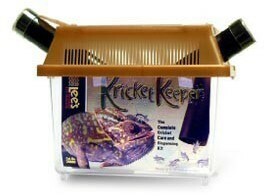 House up to 30 medium crickets for a week or longer. Dark texture cylinders provide ideal place for crickets to hide. Dark cylinders are removable for easy feeding of reptiles/amphibians/birds.